Chocolate and peanut butter, a classic combination, come together to create this moist cake that is covered in a decadent peanut butter glaze. I love using a classic bundt pan, that shows off the marbling of this cake beautifully. The original recipe is a mash up and comes from Better Homes and Gardens, a cookbook that I've had since my college days. 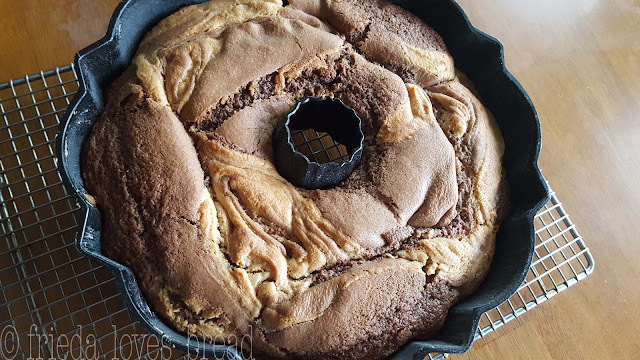 When I made it the first time, it made way too much batter, so thanks to My Kitchen Calculator, I was able to scale it down to fit my 10" bundt pan perfectly! 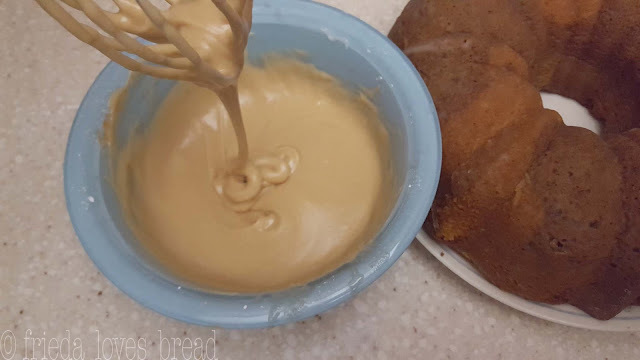 A typical cake recipe will have about 6 cups of batter, perfect for a 9"x13" cake, or a couple of 9" rounds, 2 dozen cupcakes, or a 10 cup bundt pan. The pan I'm using in this post is from Nordic Ware and I have loved using it for many years. 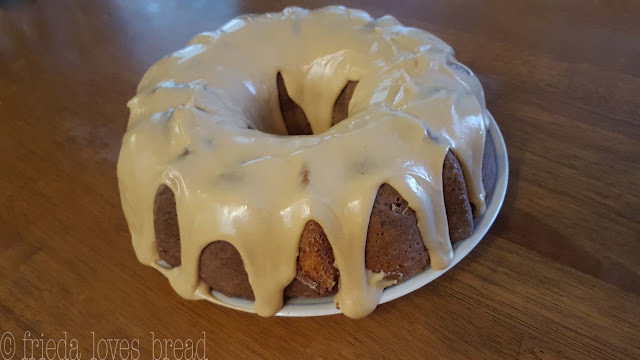 I even use a mini-bundt pan for special, single serve cakes. 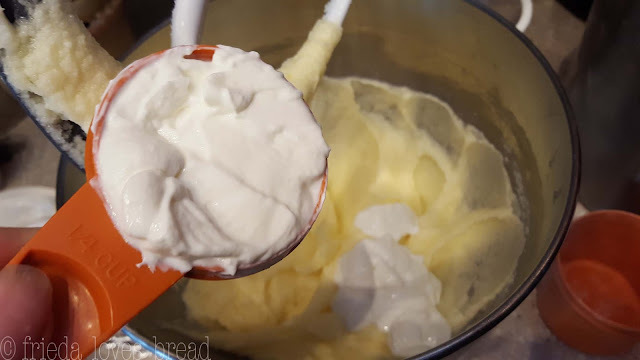 After the butter, sugar, and eggs are mixed together, you add sour cream. If you don't have sour cream on hand, you can add thick, plain yogurt. I love making my own homemade yogurt! Vanilla extract is added - did you know you can make your own vanilla extract in a pressure cooker? 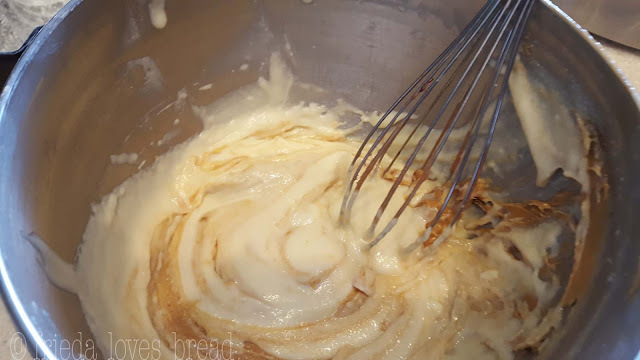 Flour, baking powder, baking soda and salt are blended in, and the cake batter is divided in half. ... and melted semi-sweet chocolate goes in the other half. Using a separate spoon (an ice cream scoop is easier!) 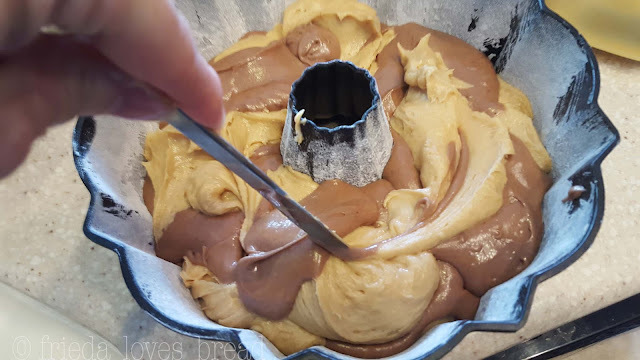 for each batter, they are alternated into a greased and floured 10" bundt pan. 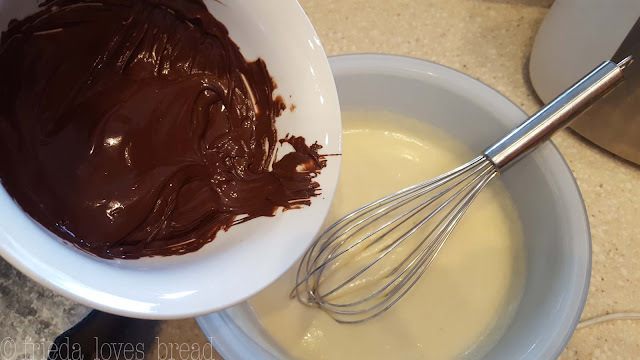 After all the batter is scooped into the bundt pan, stick a knife into the batter and begin swirling. Only do a few swirls ... if you swirl it too much, you will lose your marbling effect and end up with one single color. Check your cake at the end of baking by sticking a toothpick into the center of the cake. The toothpick should be clean, with only a few crumbs attached. If there is raw batter stuck to the toothpick, put your cake back into the oven for another 5-10 minutes. Put your baked cake on a wire rack to cool for 10-15 minutes. This is important, especially with bundt cakes. If you try to remove the cake, hot from the oven, the cake will stick to the pan and break off from your cake. If you let your cake completely cool, it will sweat in the pan and not come out with a clean, baked crust. So - set the timer for 10-15 minutes, place your wire rack on top of the cake and flip it over to reveal a perfectly baked cake, with the entire crust attached. Let it cool completely for about 30 minutes. 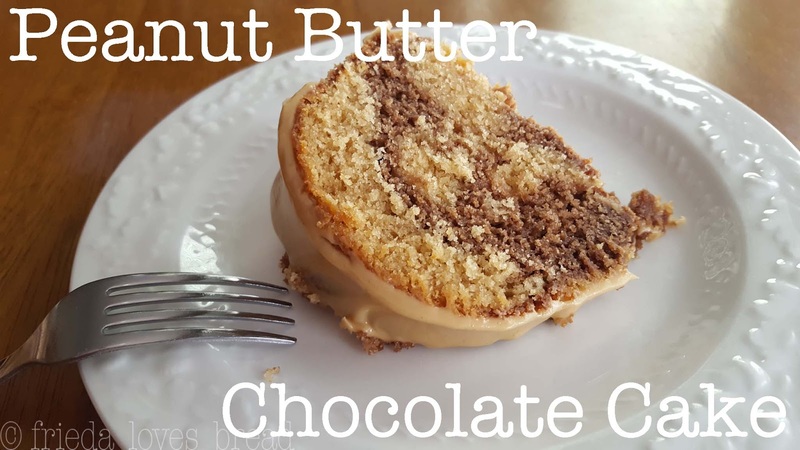 Mix up your powdered sugar, creamy peanut butter, and enough milk to create a nice, thick glaze. Caution: this glaze is finger lickin' good. You've been warned! 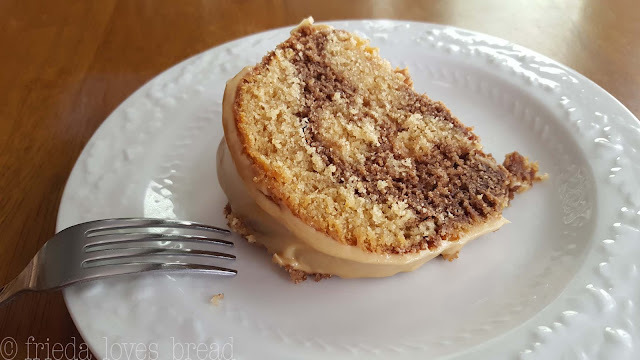 Cut into your cake and check out the marbling - the moist, tender crumb - the sweet, peanut butter glaze.... and enjoy every, delicious bite! Grease and flour a 10" bundt pan. Set aside. In a bowl, mix together the dry ingredients: flour, baking powder, baking soda, and salt. In an stand mixer with paddle attachment, beat your butter for one minute. Add the sugar and mix till creamy. Mix in the sour cream and vanilla extract. Scrape down the sides and bottom of the bowl and mix again. Add some of the flour mixture, then some of the milk, then flour mixture, etc, alternating both ingredients until completely mixed. Remove half of the cake batter, approximately 2 1/2 cups, into another bowl. Stir in melted chocolate into one half of the batter; stir in peanut butter into the other half of cake batter. 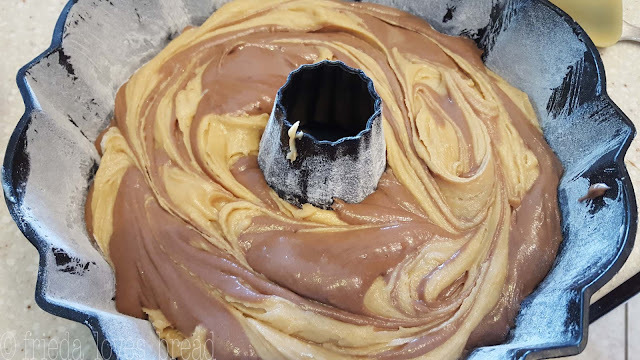 Using a large spoon (or ice cream scoop) for each batter, drop spoonfuls of each into the prepared bundt pan, alternating between chocolate and peanut butter cake batter, until the pan is filled. Bake for 50-55 minutes, or until a toothpick stuck into the center of the cake comes out clean, with only a few crumbs attached. Put the baked cake onto a wire rack to cool for 10-15 minutes. Place your wire rack on top of the cake and invert (flip over) to remove the cake from the pan. Allow your cake to completely cool, about 30 minutes. 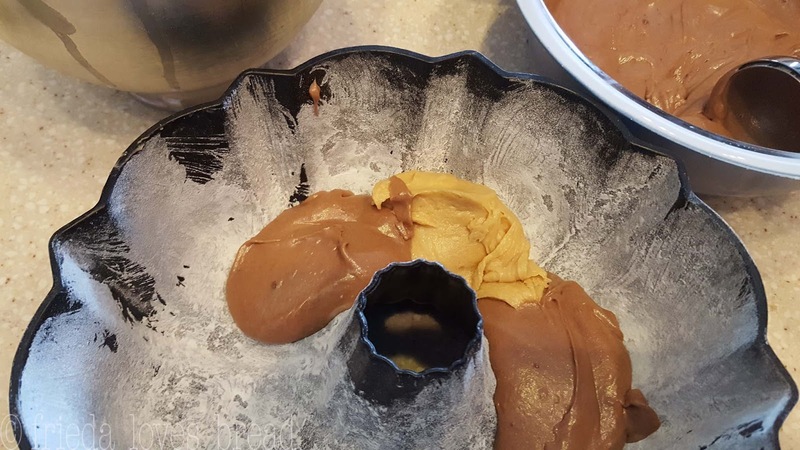 Make the peanut butter glaze by combining the powdered sugar and peanut butter (can use a stand mixer, hand mixer or whisk), then adding just enough milk to create a thick glaze. When cake is cooled, pour/drizzle your glaze on top and let it naturally run down the sides of the cake.